I love baking 3D and original cakes. When I was asked to do a Swiffer cake for a one year old's birthday, I thought it was a little strange. The mother explained that since he had started walking, the only thing he wanted to play with was the Swiffer. I started by making the floor. I took a cardboard sheet (very large) and covered it in white Fondant. With a knife, I drew the lines (to have the impression that it was wood pieces). Once the lines were done, I applied food coloring with a paint brush until it looked like a wood finish. 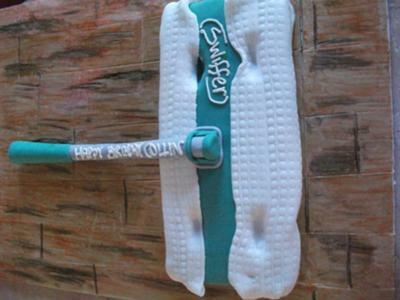 The fabric on the Swiffer was made first. I rolled a square piece of fondant. Using the 'Fondant cutter & Embosser kit', I added circles to the fondant. I placed it on the fondant floor making sure that the edges were not going to stick to the floor. I placed the cake (already iced and covered in green fondant) on the white sheet of fondant. I pulled the white sheet (the fabric of the Swiffer) around the edges of the cake. To make it look like the real thing, I made 4 dents in the cake with my fingers, added some fondant glue (fondant with water!) and placed the 'fabric' in them. The poll was made with gumpaste and fondant. I added it at the end...and Voilà! That is very cool! I really like this...and I totally understand about the baby!